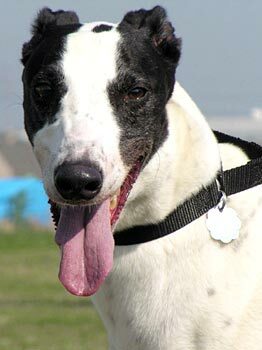 Pirate, aka Piracy, is a 3-year-old white and black male born June 5, 2005. His sire is Jimbo Scotty and his dam is Concerto. 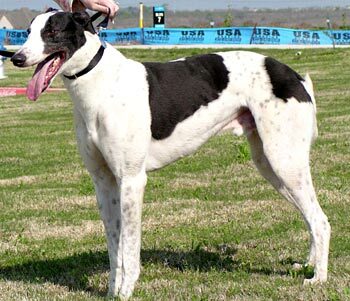 Pirate ran 24 races beginning on January 1, 2007 at Valley Race Park in Harlingen, Texas and ending June 21, 2007 at Wonderland Greyhound Park in Revere, Massachusetts. Pirate is a friendly, good-sized boy who is looking to be a life-long companion to a very lucky family. It is not known at this time if Pirate is small animal or cat tolerant. Pirate's only been with me a short time, but he's doing great and settling into retirement. His biggest dilemma, now that he isn't a racing greyhound, is trying to figure out if he's part Labrador Retreiver. He loves to chase the tennis ball. When I toss it, he grabs it and carries it around or drops it to entertain himself, but then he can't figure out what he is supposed to do with it, so he simply moves onto one of the furry toys. 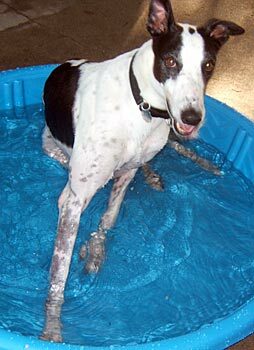 When he gets tired of the tennis ball game, he hits the water to cool down in the doggie swimming pool, which he loves! He is a sweet boy with a lot of energy, and he would enjoy a playmate in his new forever home. He has started to engage Chopper (my other foster) in games of chase, but he has more energy than Chopper (and I think he gets jealous when Chopper hits the swimming pool first). He's developing more personality by the day. We are working on house training and he hasn't had any accidents in his crate with my long days away from home. He still sleeps in his crate at night and seems to be more comfortable doing that at this point.